Nao Kobayashi is an interdisciplinary artist, who works with puppets, costume design and fabrication for theatre and entertainment. After graduating from Sonoma State University in technical theatre, she moved to Japan for 7 years, where she engaged in performances using dance, improvisation and costume, with various musicians, dancers, and artists from Japan and other countries. Her body study includes butoh, improvisation, and martial arts shintaido. She holds MFA in costume design and technology from San Diego State University, where she focused on building her teamwork communication skills through working in theatre productions and entertainment. In puppetry, she uses her skills in sculpture, fabric, and various body studies. She often works as part of an interdisciplinary collaboration team, by expanding ideas to cross borders, as well as deepening refining details. 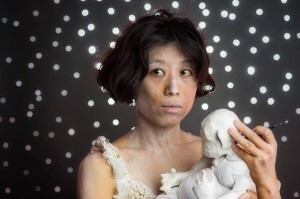 Recently she created a puppetry performance using the butoh technique to establish a mutual relationship between puppeteer and puppet. She considers her works of puppetry as a great friend of humanity, to help people to expand their imagination and bring new perspectives. In any of her wide range of works, from 2D to 3D, performance to teaching, she carries a fundamental understanding; each artwork as project —a whole experience of process of finding motivation, observation/research, trial, and reaching a result.